BP2-A: 2.4 volt 700mAh NiCd battery for Emergency Lighting. Fits in Dual-Lite and Hubbell units. 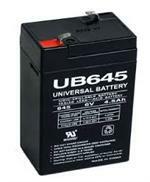 # UB645: 6.0 volt 4.5Ah Sealed Lead rechargeable battery. Good for backup power, emergency light fixtures, etc. 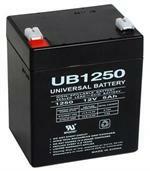 Unversal Battery brand. Dimensions: 2 3/4" long x 3 7/8" tall x 1 13/16" thick. Weight: 1.9 lbs.